The mughal emperor, Shah Jahan, after ruling from Agra for elleven years, decided to shift to Delhi and laid the foundation stone of the Red Fort in 1618. For its inauguration in 1647, the main halls of the palace were draped in rich tapestry and covered with silk from china and velvet from Turkey. With a circumference of almost one and a half miles, the fort is an irregular octagon and has two entrances, the Lahore and Delhi Gates. Form the Lahore Gate, a visitor has access to the Chatta Chowk (vaulted arcade ) which as once a royal market and housed court jewelers, miniature painters carpet manufacturers, workers in enamel, silk weavers and families of specialized craftsmen. The road from the royal market leads to the Nawabarkhana (band house) where the royal band played five times a day. The band house also marks the entry into the main palace and all visitors, except royalty had to dismount here. 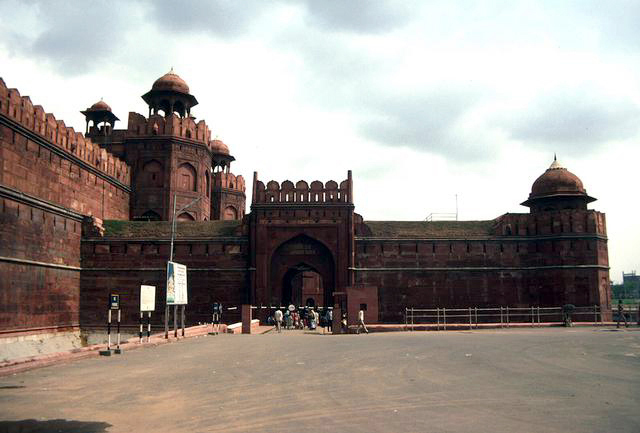 The Diwani-I-Am is the Red Fort's hall of public audience. Built of sandstone covered with shell plaster polished to look like ivory, the 80 x 40 feet hall is sub-divided by columns. The Mughal emperors would hold court here and meet dignitaries and foreign emissaries. The most imposing feature of the Diwqani-I-Am is the alcove in the back wall where the emperor sat in state on a richly carved and inlaid marble platform. In the recess behind the platform are fine examples of Italian pietra-dura work. The piece de resistance of the fort, the Diwan-I-Khas was the hall of private audience. The most highly ornamented of all Shah Jahan's buildings, the 90 x 67 feet Diwani-I-Khas is a pavilion of white marble supported by intricately carved pillars. So enamoured was the emperor by the beauty of this pavilion that he engraved on it the following words: If there is paradise on the face of this earth, it is this, it is this." Richly decorated with flowers of inlaid mosaic work of cornelian and other stones, the Diwan-I-Khas once housed the famous Peacock Throne, which when it was plundered by Nadir Shah in 1739, was valued at six million sterling. Residence of the senior queens, the Rang Mahal (hall of colours ) has a central hall surrounded by six apartments. The apartments are assured privacy by intricately carved screens which do not hinder the free flow of fresh air and light. The stream of paradise flows through the main hall, and is marked in the centre by a huge lotus shaped marble basin with an ivory fountain. Constructed by Emperor Aurangzeb in 1662 as his private mosque Moti Masjid (pearl mosque) is built with highly polished marble. The mosque is a good example of the Mughal fetish for symmetry with cusped arches, sinuous decorative designs, carved cornices and bulbous domes. 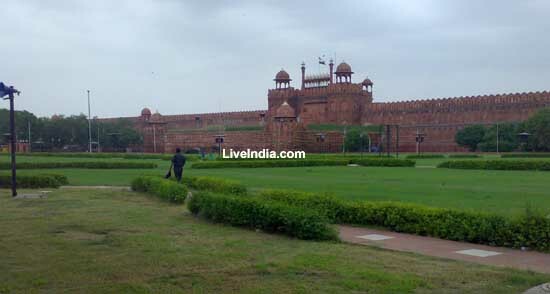 Other building of interest in the Red Fort complex are the Musamman Burg (Octagonal tower), Khwabgah (bedroom) and the Hammam (royal baths).